The gazebo is just about ready for siding. As the building season winds down, we are starting to look at how must the gazebo has cost so far. You may remember that we had budgeted about $4000.00 for this project based mostly on hopes and wishes (and the amount we had saved). Well, okay, we did have a little experience with the potting shed project so we knew at least which materials we would need to buy if not how much of each. The shed was a very expensive project though, coming in at around $7000.00 if I remember correctly, and it was a lot less wasteful of materials than the gazebo has been. There are lots of big triangular plywood offcuts lying around that just couldn’t be used in the roof of the new building just as an example. Even with that and with Hubby over-engineering just about every aspect of the project like he’s building a skyscraper we have somehow managed to spend less than the budget. Obviously, the building is not yet complete so that $3,870.19 figure is going to go up but it won’t be by much. We have a lot of supplies already purchased that are just waiting to be used. We have the rest of the framing for the door and windows; we have the door, flooring, screening and some of the shingles. In fact, about all we have yet to buy is the remainder of the cedar shingles and the metal framing for the screens. We might just be able to buy that for less than $129.81 you never know! OMG, well done. I think you should manage my budget for me! Congrats for staying so true to your estimates! Wow, I had no idea a gazebo would cost so much. Makes me glad our house purchase came with a shed and a garage! Sounds like it might have been cheaper and easier to buy one already made? We came to that conclusion once over a chicken house. My husband built one at some cost and with quite a bit of determination but later on we bought one, which lasted for some ten years. It was well worth it. Still, if you enjoy the work, why not and you will treasure it once it is finished. After all the work we put into this project this year it would seem like there must have been an easier way to go about getting a gazebo. Then I remember that we did a lot of searching for plans or kits this spring and for a gazebo this size the kits were thousands of dollars more expensive and most were being sold in the States. If we had found a plan on offer that we liked we might have saved some money through more efficient use of materials but none of the plans we saw were pretty enough or detailed enough to suit us so we went with the do-it-yourself and design-it-on-the-fly method. We're pretty happy with the results. Wow-great accountant you are! I remember my dad building our horse barn when we were teens. Tons of work-we all helped- but we treasured that barn. I drove past the old house when I was home in June...the barn is still there and it brought back so many memories just to look at it....you will treasure your gazebo for years to come! Wow - that's amazing - I would have thought it would cost a lot more than that! Just imagine if you had to hire a carpenter as well lol! Ya but my carpenter works for beer breaks so it can get expensive. I'm glad you were able to estimate so well, and i'm sure part of that is due to hubby's willingess to over-engineer everything and make sure it was suitable for both of you. My former neighbour is extremely mechanically blessed, and he found similar to what you did when he wanted to build his deck. He didn't like any of the readymade ones, he knew what he wanted, so he built his own. He didn't pay himself (although he also worked for beer breaks ;-) and found much of the materials on sale. Even so, cost-wise he didn't really save $$, but his deck is beautiful and a far better value. I've a feeling your gazebo is the same way. Knowing that you stepped outside the box and tackled a big project that that you thought may have been beyond your capabilities is a very satisfying feeling. Even more so if you actually accomplish that task. Hubby will be the first one to say that the gazebo is not perfect, the corners are not all the exact same angle and some of the post are not exactly plumb, but he is pretty proud of his efforts. Several years ago we were looking to add a deck onto the back of the new house and we decided to hire a professional to do the work because we weren't comfortable doing the concrete footings. What a joke. It turned out to be dead simple and even then the guy did a half-assesd job. It would have been no worse if we had done it ourselves. That little experience gave us the confidence to just go ahead and build this thing. Satisfaction in the work you do with your own hands does add value. Wow well done you did well and boy you are organized. Can't wait to see it finished . I should have explained the deck better, he wanted one that was a hexagon shape out to the grass, but to be accessible from different entrances on the back side of the house. He also wanted the floor boards (i don't know the proper term when speaking of decking) to repeat the hexagon pattern in the middle. He designed his own garage, too, which he said was much simpler because it was just a box wired with electricity and a second storey. The engineering part of the deck, which i recalled when looking at your gazebo, was in figuring how to lay out the boards to recall the hexagon throughout. Measure twice, cut once. I just love the look of your gazebo, i'm sure you'll spend many happy hours in it and made all the sweeter for having done it your own way and by yourselves! Hello!! I stopped by your blog last week, and got distracted and didn't leave my thoughts--Today, I'm back to do that. I just wanted to first tell you how much I LOVE your Halloween collection!! What fun pieces you have to enjoy!! I also admire how well you've kept track of your spending for your gazebo. 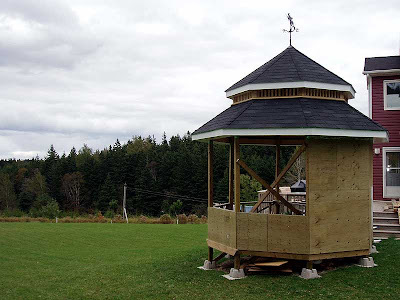 So many times I see where projets like this end up as 'runaway train' with not a lot of thought put into cost and utilizing the materials--You've not done this, you've kept it all in mind, and done an amazing job and are going to have an amazing gazebo to enjoy for years to come!! Megan's neighbour sounds like he knows what he wants and is willing to do the work to get it. We are also planning to lay the decking in the gazebo in an octagonal pattern, a series of concentric rings narrowing to the centre. We are also going to lay fibreglass screen over the joists before putting down the floor boards so that the bugs can't get in by coming from under the floor. It is becoming increasingly likely that we will not get to this this year so, but who knows? Besides, maybe Hubby will come up an even more complex idea before the spring! My Gazebo May be A Two-Year Project!